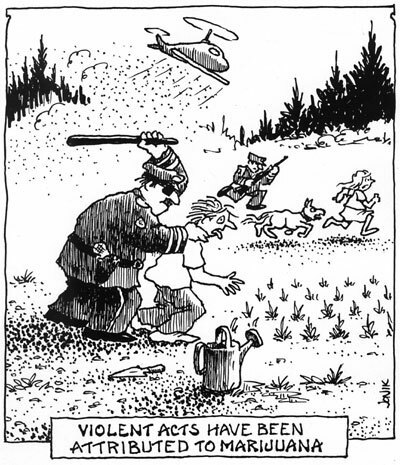 I stumbled across this comic on NORML's website, and I think it really encapsulates one of the biggest hypocrisies of the War on Drugs : the illegality of marijuana, rather than reducing crime and use as per its goals, actually increases violent acts. The Drug War has claimed many victims, including many innocent bystanders. * Read about the Georgia Pastor who was gunned down in his car. Link. Read more heart-wrenching stories of Drug War fatalities here. "With this, our city has reached a new historic mark in violent acts that verifies that this is the most violent zone in the world outside of declared war zones," Norte newspaper reported Tuesday. * "Though little more than 1 percent of Mexico's 105 million population lives in Juárez, it accounted for a third of the country's nearly 5,400 gangland murders last year, according to the federal government" Link. * More than 2,600 people were killed in 2009, which is more than a thousand deaths higher than 2008, and according to Chihuahua state police, four more were murdered within the first twelve hours of 2010. Link. * The severed heads of four men have been delivered by a courier service to a police station in northern Mexico, according to the local authorities. Link. * 85 children and 107 women also were among this year's victims, according to Norte newspaper. The death toll also included 49 police officers and several attorneys. More than 10 were U.S. citizens, the Chronicle has previously reported. Link. * Prosecutors said the one man's body was found on a street with its hands and head cut off. Another man's body, with its head cut off and eyes gouged out, was found elsewhere. Link. * About 60 percent of the drug cartels' revenue comes from the sale of marijuana to the United States, [City Rep. Ortega] said. Cutting off a significant source of its revenue could prevent the cartels from continuing to "kill and terrorize with impunity" Link. * "[The Citizens] no longer have faith in their authorities; they have no faith in the military; they have no faith in the police; they have no faith in the state and local police forces," Link. While the cartoon posted above is certainly lighthearted, nothing is more serious than our responsibility to the Mexican people to stem the violence in many border cities (not even talking about the widespread American gang violence here). This starts by cutting off the funding of the drug cartels, who are fighting for control over drug passages into the United States. Spread the word to those you care about.